Steve Vai is cool enough to get away with indoor sunglasses. We are not. Today is set to be the busiest day of LIMS 2009. Not only is it the day with the most public attendance (the ExCel Centre is heaving), but it's the day the stars come out to play. And at the top of the bill is Steve Vai - who's about to unleash his Alien Guitar Secrets show/workshop/zen-guitar-extravaganza on the not-so-unsuspecting public. Not-so-unsuspecting, because seats at the workshop are scarce and sold quickly - although this is hardly surprising: lucky ticket holders will be privy to Steve's expert teachings gleaned from 30-odd years as one of the world's leading guitarists. Steve will cover everything from the music business to finding your own musical identity, and some fans will even get the chance to jam with the triple-Grammy-winner. But that's today. 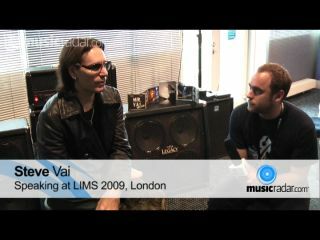 So what was Steve Vai doing yesterday? Well, chatting to MusicRadar, of course. Video camera-in-hand, we were ushered into a private room to film an exclusive interview - on Alien Guitar Secrets; on Naked Tracks; on his upcoming live DVD, Where The Wild Things Are; and on, erm… beef yoghurt (Steve brought it up, not us). We were also treated to a sneak preview of the new DVD - although, despite our best hidden camera efforts, MusicRadar was unable to film any of it. But it was impressive stuff none the less: expect crazy visuals, dazzling arrangements, virtuoso violinists, a strap-on drum-kit complete with smoke-breathing skull (really) and, naturally, plenty of brilliant guitar playing.